Our host this Monday is Frank with the word ‘troll’ or any variation or arrangement of it. Posted in Quadrilles. Tagged dverse Poets Pub, Quadrille, Troll. Very nice! I like the thought of trolling for pearls to pay the mermaids and dreaming is a good time to do all of that. I love paying the mermaids with pearls! fun take on the prompt. Ah, you trolled the dictionary and showed the many meanings of our chosen word – well done, Kim! Paying the mermaids with pearls is such a delightful thought! I love your troll triple play. So well done, Kim! Oh, lovely. I was reminded of Tom Bombadil. I hope those nasty trolls stay well away from you, Kim. Those last 2 lines yanked be back to the now. Nice one. I appreciate the various forms of the words; love me some mermaids as well. When you fish from a slow moving boat, that’s trolling too. That is one ugly troll for sure! Your dreams may turn into nightmare. Yes, my boys had a favorite troll they played with when they were young! This is so danged clever, Kim! Your troll ho ho seems engaging! so many levels on this one. lovely! The ‘de loll’ comes from a children’s story in which the troll sings a chorus: “I am a troll, troll de loll”. 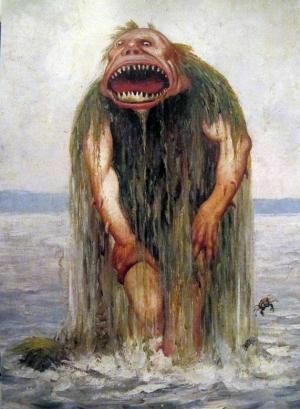 Sea trolls, held at bay by mermaids paid in pearls! Simply lovely, Kim! Perfectly titled and illustrated…a delightful read!